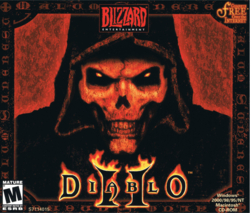 Diablo II is a game that was released by Blizzard Entertainment in 2001 for the Windows and Mac OS. The game takes place after the first game — with the defeat of Diablo and the Hero taking of Diablo's soul stone. The Hero, influenced by the soul stone, wanders the land under Diablo's corruption until Diablo takes over, at which point he settles within a hell-like region where he commands his minions from. The need for new heroes has arisen; only the destruction of the soul stones of Diablo and his brother Mephisto will bring peace to the land. Players traverse four world areas (Acts), each with its own town. Each area is found to be full of dungeons, hostile creatures and troubled citizens in need of support against Diablo's forces. This page was last edited on 29 May 2016, at 18:25. This page has been accessed 42,618 times.